sometimes your page url may be like this - http://www.facebook.com/pages/pagename/334319236534?sk=wall , in this case your page id will be 334319236534. When you generate page token, you will be needed to enter numeric page id so if your page url look like this - https://www.facebook.com/anypagename then getting the id is little tricky - to get id load your fb page in a browser, right click on the page and select 'view source' to view your web page source, then find(ctrl+f) for 'page_id' and you will see 'page_id=34343434' somewhere, so your page id is 34343434. Always verify it's your page by loading page url putting page id in browser as follows - https://www.facebook.com/34343434/. Attention: After facebook's breaking changes things are not working properly so i am trying to find a solution to display profile posts Displaying profile feed will not be good because of lots of restrictions and privacy, but still you can display lots of public posts and activities. If you created facebook application before 30th April 2014 and using it's token to display feed then to get profile id, login to your facebook account, go to profile page, your profile id will look like in the image below (example - mridulcs) or use this tool to get id. If sometimes you see 'no posts to share' in feed display then go to plugin settings and check for 'Show guest entries' field and increase number of posts value. Attention : From 1st May, 2018 facebook made breaking changes because of FB cambridge analytica scandal. From now on app created after 1st may, 2018 need to be submitted for review to use specific permissions (Go to "app review" page from your app dashboard for details). But good news is you can still display your page/group posts by making your app in development mode and generating token by the below steps. You have to be admin of your FB app and page/group. But you will have some request limits. So to overcome all problems you can just submit your app for review. If your are displaying your own facebook page posts then you need to submit your app for review for manage_pages permission. If your are displaying your own facebook group posts then you need to submit your app for review for Groups_API feature. So if you know how to submit app for review then do so else i can help you, it's a very complex and time consuming process. At last step of it, You have to go through business verification or if you do not have business then you need to submit national/passport id for individual verification(it has little limitation). In case of business verification, you will be needed to submit your business info and images of your business documents like business license, Business utility or phone bill, Articles of incorporation document, Business tax file, certificate of formation, etc. You can submit all/some of these document images. 2. 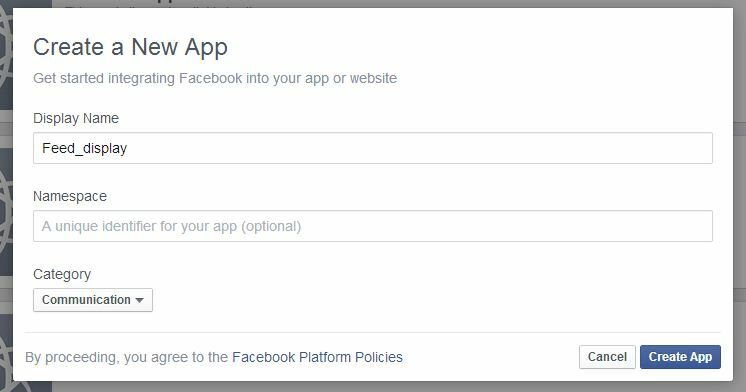 Read the "How to create facebook application" section below to know how to create your facebook application and use it's app id and security code to generate access token. a) if you are generating token and you don't own the facebook application by which you will generate token then you should be added as a tester role in the application. For this the application owner need to add you as tester role by clicking "Add Testers" in the "roles" section of the application. Easy to do, contact if any problems to do so. b) if you are generating token and you don't own the facebook page and enter that page id in last steps of page token generation then you will get errors. So to overcome that problem ask the page owner to assign you any role from the "page roles" section of page settings. (iii) Finally in 3rd step you will be asked to enter FB page id in numbers(at this step you can see generated user token in the input box), if you enter page id and click submit then you will see your page access token in response which is shown below as an example. put this access token code in 'Access token' box in general settings tab and save your settings. 4. If you are displaying a Facebook group posts then you can either use a application token or page access token or user token. To generate page access token follow steps written in step-3 above. To generate user token follow step-3 above again(you will see user token in final step, FYI user token expires in every 2 months). To generate application token go to this token generation link here. FYI page and app tokens don't expire. 5. If you are displaying a Facebook profile posts then wait because after facebook's breaking changes things are not working properly so i am trying to find a solution. Because of facebook's occassional layout changing, you may see little mismatch with the following images and steps for creating app and configuring. But you can still understand that easy process. Contact if any problems. step-2: click "Register as a Developer"/"Register now" button.A popup will appear as shown below.There check the policy acceptance check box and click continue. enter your mobile number and verify and clicking continue buttons complete rest of the steps by entering compulsory inputs. step-3: If you completed step-2, you will see a "developer"/"Manage apps" section there at left side in home page of your facebook account. security check and if you complete this, your app creation is complete and you will see that application's dashboard page as shown below. this page also reachable from your account's home page developer/manage apps link or from here https://developers.facebook.com/apps and then by clicking on that app. Finally, you need to make your app live so that it is accessible from anywhere to make feed display work unless you intentionally made app in development mode for app review issue.To do that make sure On/Off button is set as ON at top right side(where app status also shown) in your app dashboard. In the above picture App ID and App Secret codes(click show button to see secret code) you will need to enter in the boxes in access token generation page. That completes applicaton creation and configuring. i) If you get error while generating token(for previous plugin version 1.0) like - "Given URL is not allowed by the Application configuration. : One or more of the given URLs is not allowed by the App's settings. It must match the Website URL or Canvas URL, or the domain must be a subdomain of one of the App's domains." That's because you haven't entered "Site URL" field of your application setting, as shown in the last image of last step for "How to create facebook application" section above. Make sure system requirements are met(look for the tab in settings page), facebook id and access token are correct. Also, increase the Show number of posts value from settings becuase non-pro version only shows status/textual posts of page/group/profile so there may not be enough status posts in the number of posts value specified, make sure there are no restrictions set in facebook page/group settings comparing with other page/groups for which feed works, mainly remove country and age restrictions in page/group settings. If all failed, you have contact options. iii) Why my facebook profile feed not displaying properly? If you created facebook application after 30th April 2014 and using it's token then profile feed may not be displayed for new facebook Graph API.Actually Displaying feed for profile shows only public and selected posts because of various restrictions. So it's not good idea to show profile feed. it may be because of some restrictions you set in page/group/profile settings. For instance, in a page settings if "Age restrictions" setting is set to "Alcohol-Realted" then a question mark will appear instead profile picture. There may be other issues, contact us. vii) only last two comments appear per post & "view all comments" button not appearing - That's because facebook deprecated some fields, There may be other issues, contact us. 2. using the app to do facebook development not following policy - https://developers.facebook.com/policy/ properly like if you post or comment by same text( like "test comment") to a facebook page by graph api again and again in a short time, then it look like spammy to facebook, these kind of violations written indirectly in policy. to be sure facebook application will not be deleted, don't use ur application by which you generated token for other developments improperly. zip - "facebook-wall-and-social-integration_v1.0.zip", install it via wordpress.If installation failed then unzip this main zip and again rezip using winrar. Make sure under that new zip - "facebook-wall-and-social-integration_v1.0.zip"
there is only one folder "facebook-wall-and-social-integration" and contents inside it, now go on and install it. and inside of the zip there are content directly not under another folder, install this zip via wordpress. "wp-content\plugins\facebook-wall-and-social-integration\" Then activate the plugin from the plugins menu in wordpress admin dashboard. x) How you get post id to filter posts by post id? click the date on any post in facebook then it will be loaded as a single post, there look for the post id in the url in numbers. In case of page post sometimes thare are multiple ids in the url, look for "story_fbid" value. FB may change things in a future time, use google to get post id.